When a child is just learning to read, comics can be a great supplement to help foster love and enjoyment for books. As detailed in this wonderful handout, “Raising a Reader,” from the Comic Book Legal Defense Fund, comics have a lot to offer young readers. For that crucial first stage of early reading (ages 5-8, grades K-2), though, it can be hard to find appropriate comic book reading material. Many parents will either disregard comic books as a reading option or assume that any old superhero comic will do. The appropriate range of choices for this specific age group and reading level is actually pretty narrow, but it contains some fabulous picks. I’ve put together a list of 10 great choices to consider giving your early reader. I’ve tried to keep in mind both reading level and content appropriateness. Also, it should be noted that 98% of today’s superhero comics are written for a minimum age of at least 13. Both Marvel and DC publish a couple of choices for younger readers based off their animated TV shows, but even those tend to skew older than the reading level we’re talking about here. Without a doubt, the best go-to option for parents looking for quality comics for early readers is the many graphic novels from Toon Books. Started in 2008 by comics power couple Françoise Mouly (art and comics editor for the New Yorker) and Art Spiegelman (creator of the literary comics masterpiece Maus), Toon Books is the only comics publisher that organizes their publications by reading level. For early readers they have a number of great offerings spread across two levels: Brand-new readers (ages 3+, grades K-1) and Emerging Readers (ages 4+, grades 1-2). They also publish books for later stages like grades 2-3 and beyond. The best part about Toon Books is the quality of the creative talent that Mouly and Spiegelman have tapped. There are books in these early levels by outstanding cartoonists such as Lilli Carré, Renee French, and Rutu Modan, and children’s book award-winning contributions from Jeff Smith and Eleanor Davis. Most books come in hardcover and softcover format and are pretty readily available in bookstores, but you can browse them all on Toon-Books.com. Difficulty: The best part about Toon Books is they clearly label each book according to grade level beginning at K-1 up to Grade 3+. Content: Think of these as a bridge between reading picture books and reading comics. The varied offerings include lots of books about cute, anthropomorphic animals learning moral and educational lessons. Where to start: You can’t go wrong with Eleanor Davis’ award-winning Stinky, about a monster who is afraid of people but learns that, once you meet them, they’re really not that scary. For early readers who are still trying to gain their confidence with the written word, there are comics like Andy Runton’s Owly that let the pictures do the talking. These cute, award-winning books are mostly wordless, sometimes using word balloons that contain pictures instead of words. This is a great way of getting new readers into the flow of reading—especially comics reading—without stumbling over word recognition. The stories usually center around friendship, loyalty, and nature and are charmingly innocent. While there may not be any words, Runton’s illustrations will give you and your little reader a lot to look at and talk about. Difficulty: Since there are no words, even pre-readers can pick these up. Content: These are very innocent stories, completely devoid of violence or adult themes. Where to start: Runton is in the process of shifting to self-publishing the Owly books and you can learn about them on his website (he even has a lot of free PDFs you can download to sample). There is a pretty big library of Owly books that are readily available in most comic shops, bookstores, or Amazon.com. Why not start at Volume 1? Art Baltazar and Franco Aureliani have made a name for themselves by creating all-ages superhero comics in their very recognizable kid-friendly style. They’ve applied this style to everything from their own creations like Patrick the Wolf Boy to “Itty Bitty” versions of horror comic characters like Hellboy and Vampirella. 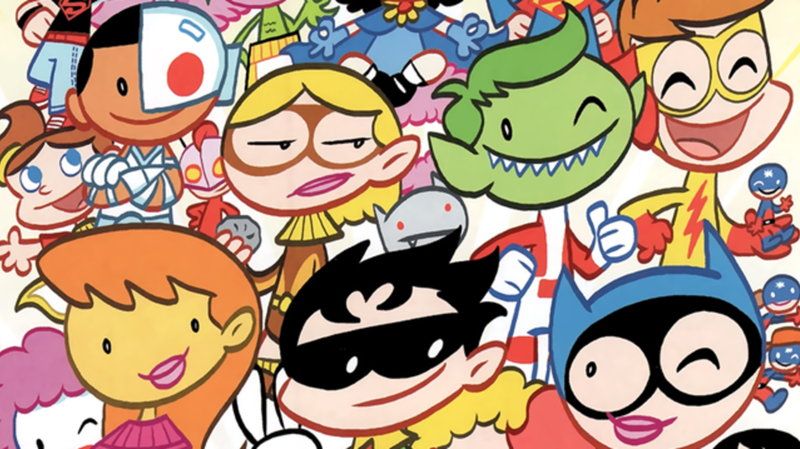 The book that put them on the map, though, is Tiny Titans which ran for 50 issues from 2008 until 2012, twice winning the comics industry's top award for Best Kids Series, and has been collected across 8 volumes of trade paperbacks. Difficulty: The books consist of short stories—mostly 2-4 pages in length—and the storytelling relies a lot on visual gags so the word count is pretty low and non-intimidating. Content: The stories are focused on elementary-school versions of many DC Comics characters (primarily those associated with the Teen Titans like Robin, Cyborg, Beast Boy, and Aqualad) and it’s more about being in school than fighting criminals. Some of the jokes may require some familiarity with the DC Universe and other pop culture for kids to fully “get” them, though. Where to start: You may be able to find some random back issues at certain comic shops, but since the series has ended, your best bet will be the trade paperback collections like Tiny Titans Vol. 1: Welcome to the Treehouse. How can you go wrong with nursery rhymes and fairy tales? Especially when they’re drawn by some of the best cartoonists in the business? First Second Books and editor Chris Duffy had the brilliant idea of putting together two separate large collections (there are 50 nursery rhymes in one book and 17 fairy tales in the other) by a dream lineup of primarily indie-comic stars like Roz Chast, Gene Luen Yang, Mike Mignola, Jamie and Gilbert Hernandez, Emily Carroll, Raina Telgemeier, David Mazzuchelli, Eleanor Davis, Stan Sakai, and others. Difficulty: As you might be able to surmise, the Nursery Rhyme collection skews a little younger, but both are perfect choices for this reading level. Content: Kids will recognize most of the stories here, but they do mix things up with a couple of obscure selections in each. The fairy tales are certainly no more disturbing than any Grimm fairy tale you read when you were young. Where to Start: Both books should be pretty easy to find wherever books are sold. Unexpectedly, one of the most enjoyable kids comics to come out in recent years is Scooby-Doo Team-Up which, each month, has the Scooby Doo gang meet various DC Comics heroes as well as characters from classic Hanna-Barbera cartoons like the Flintstones and the Jetsons. Parents reading along will appreciate writer Sholly Fisch’s inside jokes in relation to these old shows. Difficulty: The vocabulary should be within most early readers' ability. These are written a little more like a standard comic book than the previous entries on this list, with lots of word balloons and pages with many individual panels. This will pretty much be the case with the rest of the items on this list, but I point it out because navigating the architecture of some comic pages can be intimidating for some readers. Content: These are fun stories and actually a better, kid-friendly introduction to superheroes like Batman, Superman, and Wonder Woman than you’ll find in 95% of all other superhero comics today. Where to start: As of this writing, the 9th issue of the series was just released, so most comic book shops should at least have the recent issues in stock. You can start with any issue as they are mostly self-contained stories. Why not start them with the classics? Carl Barks’ Uncle Scrooge comics from the 1940s, '50s, and '60s are widely considered to be some of the greatest comics ever made. Unlike a lot of comics from that era, though, they hold up really well and will still get laughs out of kids today. Difficulty: There is some complicated wordplay at times and the occasional old-fashioned jokes and plot line that may go over some kids' heads. Content: At a certain point Barks—and later Don Rosa—began to tell stories with Scrooge McDuck and his nephews Donald, Huey, Dewey, and Louie, that took on a globe-trotting bent with archeological digs and explorations of far-off cultures. These would inspire the popular Duck Tales animated series of the 1980s. Huey, Dewey, and Louie’s adventures may inspire a yearning for knowledge in your own little Junior Woodchucks. Where to start: Fantagraphics has put out many collected volumes of the classic Uncle Scrooge comics. They generally run about $30 each but are beautifully put together. Most public libraries are bound to have an Uncle Scrooge book or two on their shelves if you want to sample them that way. Luke Pearon’s Hilda series of graphic novels follows a young elementary-school-age girl who lives in a village called Trolberg, populated by talking birds, giants, black hounds, and, of course, trolls. Otherwise, her world is not much different from our own and Hilda is not much different from any other girl her age. She’s smart and sassy, lives alone with her mom, and loves animals. That realism amidst the fantasy world she exists in is what makes this series so enjoyable for kids (boys and girls alike). Pearson has a wonderful, European sensibility to his cartooning, which matches the vaguely Northern European setting of the stories and makes these books a delight to read. Difficulty: The reading level shouldn’t be a problem for grades 1 and up and the page lengths (the first two books are 44 pages and the third is 64) are long but achievable. Content: Very kid-friendly stories with nice life lessons, but they’re also thoughtful and sophisticated in a way that makes them rise above kiddie fare. Where to start: The very first book, Hildafolk, is a 24-page comic, but Pearson has moved into a longer, more European-style graphic “album” format. He has released three book-length adventures so far and the most recent, Hilda and the Black Hound, is absolutely fantastic, with Pearson taking everything he’s built so far and making a nearly perfect all-ages comic. Brad Meltzer and Chris Eliopoulos’ Ordinary People Can Change The World series of picture book/graphic novels about famous people who made a difference in history is an easy-to-read and fun way for a child to learn about important figures like Abraham Lincoln, Rosa Parks, Albert Einstein, and even (in an upcoming volume) Lucille Ball. Both writer and artist are familiar names in the comics world. Meltzer is more famous as a novelist, but comic fans will know him as the writer of DC’s Identity Crisis, while Eliopoulos has illustrated a number of comics for kids like Franklin Richards: Son of a Genius. Difficulty: There are some lengthy picture book-style text pieces in addition to the comic book-style word balloons, but it’s all written for a Kindergarten-and-up audience. Content: I think some educators and sticklers for facts have questioned the validity of presenting biographies in this way, but it’s certainly a great way to get young kids interested in history. Where to start: There are currently 5 stand-alone volumes (I am Abraham Lincoln, I am Amelia Earhart, I am Rosa Parks, I am Albert Einstein, and I am Jackie Robinson) that are readily available in the children’s section of most book stores. Abigail and the Snowman is published by Boom! Studios and written and drawn by Roger Langridge (most recently known for his spectacular run on the Muppet Show comics). It’s a funny story about friendship in which a 9-year-old girl named Abigail moves to a new town with her single dad and struggles to make friends until she meets Claude, a Yeti who has escaped from a secret government lab and who only Abigail and the other kids at school can see. Kids of all ages – boys and girls alike – will get a kick out of Abigail and Claude’s friendship. Difficulty: Langridge is masterful at character design and physical comedy and that really goes a long way in making this fun to read. Content: There are some government agents chasing Claude but the danger here is not too scary. Where to start: This is a four-issue limited series that is still in the midst of its run as this is being written. The fourth issue is yet to be released, but most bigger comic shops may still have the first three issues. If not, a trade paperback collection will surely be out in a couple of months. Where to Start: Drawn & Quarterly has published four volumes of Anna & Froga stories: Fore!, Thrills, Chills and Gooseberries, Want a Gumball?, and I Dunno, What Do You Want To Do? They all feature various self-contained stories so you can jump in anywhere.